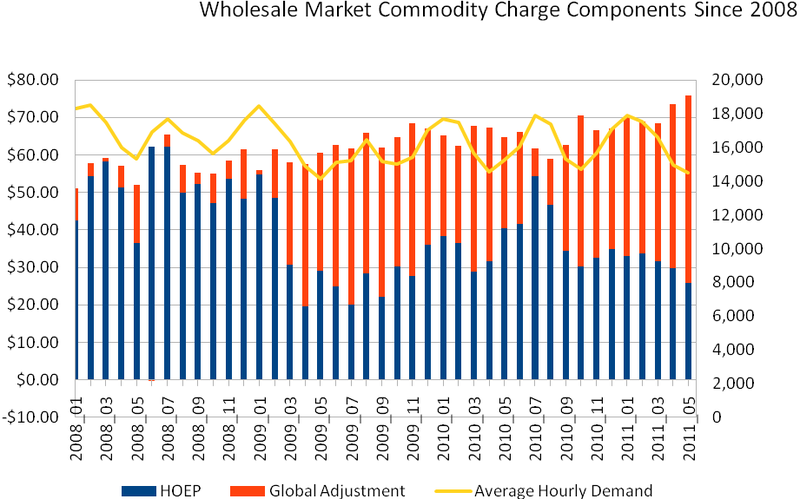 The Independent Electricity System Operator (IESO) has released the Monthly Market Report for May 2011, and it confirms the message of rapid price inflation for Ontario's business sector. 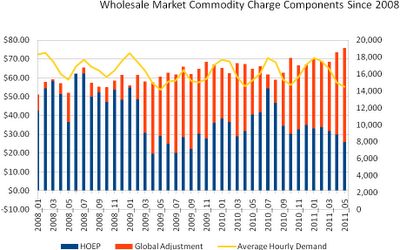 The Commodity Charge for the businesses/industries subject to the wholesale rate soared to $75.94/MWh, driven primarily by a Global Adjustment charge of $50.05/MWh. That is a 17% increase over May 2010's $64.73. The total rate of $98.90, including delivery and all other charges, was only 14% higher than one year earlier. That's as close as businesses can expect to get to good news as a glutenous Ontario Power Authority continues to contract additional, and extraordinarily expensive, supply - despite the oversupply we so clearly have. May 2011 Ontario consumption dropped 5% from the same period in 2010.